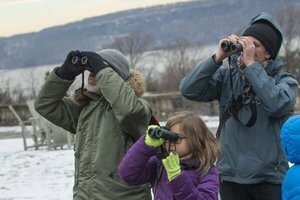 Winter Birding at Wave Hill on Sunday, December 9 beginning at 9:30 am. The Hudson River Valley hosts an impressive diversity of bird species during the winter months. Explore Wave Hill’s tranquil gardens and woodlands with naturalist Paul Keim to observe birds in their winter habitats. Birders of all levels welcome. Ages 10 and older welcome with an adult. Severe weather cancels. Free with admission to the grounds; NYC Audubon members enjoy two-for-one admission to the grounds.